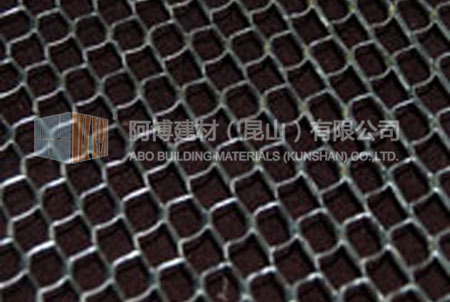 Tilath (paper back metal lath) is diamond mesh lath, regular or self-furred, to which offset asphalt saturated kraft building paper has been applied. The grade D paper typically used is water resistant, yet highly vapor permeable. Tilath reduces moisture penetration while allowing for the dissipation of moisture vapor from within the structure. A foundation weep screed at the bottom of all framed walls aids in the evacuation of any moisture that might reach the surface of the building paper. (Required by most codes) The offset paper, which is recessed from one end and one side and overhangs on the opposite end and side, allows the applicator to easily install this product correctly as prescribed by ASTM C1063. This specification requires that paper be ship lapped, paper-to-paper and metal-to-metal for proper installation. Tilath is ideal for use as a base for tile and traditional stucco. The paper backing aids in plaster keying and stucco curing, protection of the sheathing during curing, and provides moderate water resistance. Self-furred Tilath is provided with "V" groove self-furring mechanisms. Scratch coat is fully embedded in the lath and is isolated from supporting structure. Water resistant backing paper allows controlled and uniform curing of this plaster foundation. Scratch coat is being applied to "V" Groove Self-Furred Tilath. The lath is attached to the framing members with wafer headed screws. A screw is placed into each self-furred mechanism.